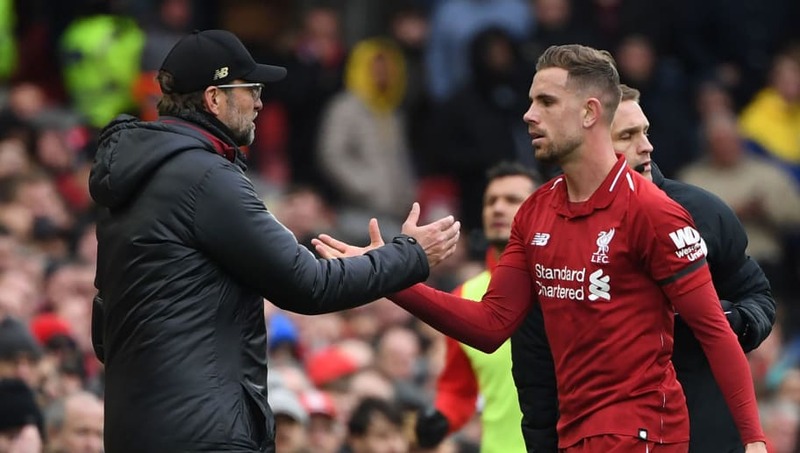 Liverpool captain Jordan Henderson has revealed how Jurgen Klopp's half time team-talk was the inspiration for his side's 2-0 victory over Chelsea on Sunday afternoon. The England midfielder - who put in an impressive display during the victory - has praised the German manager for his confidence in the side, suggesting that Liverpool's impressive second-half performance was a result of Klopp's words of encouragement. During his post-match interview ​with Sky Sports, ​Henderson was asked what Klopp had told his ​Liverpool side at half-time, humorously responding: "Can't tell you that." Joking aside though, the midfielder spoke sincerely about what Klopp had said to build on, as he added: “It was keep going, keep doing the right things. "Couple of things we needed to work on. Create better spaces for each other. Henderson assisted in ​Sadio Mane's opener, delivering a cutely chipped ball across the box for the Senegalese forward to nod in at the far post for his 18th goal this season. As Chelsea struggled to get a foothold in the game after Mane's opener, moments later Mohamed Salah's wonder strike buried all hope of a comeback for Maurizio Sarri's side. Henderson went on to say how immense he thought his side performed at that point in the match, adding: “I thought there was a period where we sort of blew them away a little bit. “I felt as though, on top, we could have scored maybe one or two more. "But, they had a couple of good chances as well, so we need to be careful with that." ​Sunday's win sent Liverpool back to the top of the table, two points clear of ​Manchester City as the two clubs battle it out for ​Premier League glory. For Jurgen Klopp's men however, they will have to contain their excitement as they travel to Cardiff on Saturday looking for another vital three points in the Premier League.